Today saw a lesson in how, if you don’t try to hard, a great many things are possible without the Right Achievements. 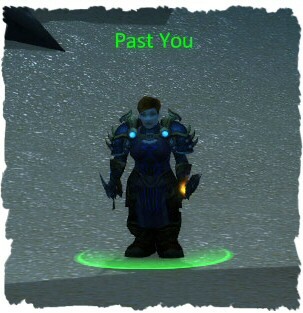 The Rogue has, since she hit 80, been indulging in Large Amounts of Pottering. I’ve bought some items from the AH, but in the main she’s been clothed via the Random Dungeon Tool. This means putting up with variable amounts of crap play, stupidity, fights & strops (neither from me I should add) and the accumulation of Elbows of Triumph. I’d collected sufficient from levelling from 70-80 to afford the Tier 9 gloves when I started this process, and as you can see I now have shoulders and legs to add to the collection. As I grew in gear level my options increased in terms of reward drops. I didn’t deliberately queue for any dungeon, I wasn’t farming any particular piece of gear. As things went, it was all very measured. When Heroic Forge of Souls finally became an option, I got very VERY lucky. I won both Blood Weeper and the Unsharpened Ice Razor in one run. For a Combat Specced Rogue, I really couldn’t have done better: slow main hand, faster offhand, both daggers: it was job done in one hit. Both had Berserking enchants waiting for them, paid for with the cash I’d made via levelling. I know I’m not likely to see better weapons before Cataclysm, and I’m well aware just how fortunate I am to have both drop in the same run. As it stands, my drop luck with the Rogue has been stellar. I’ve grabbed 232 neck and the crossbow thus far from Dailies in ICC 5 mans, and last night I finally saw the inside of the Halls of Reflection (even if I never made it to the first boss) So, with continued luck and quiet faffage I suspect the last few items of blue gear will fall away. I have Superior, in less than a week from hitting 80. All things are indeed possible. I also have the full sweep of 10 and two of the 25 man VoA achievements. I didn’t have an achievement to link, and I got thrown out of one 25 man when I couldn’t produce them, but the next person I whispered for a Raid didn’t ask. I kept quiet, stood away from the rest and managed 4k dps on Toravon. It wasn’t great, but it did the job, and with the 25 man achievement I blagged a 10 man run and got all 4 of the bosses in one hit. I didn’t get any loot, but I now have a way into Elbows of Frost. It also helped that this week on the server was Noth the Lolbringer Must Die! My Frosty Total is looking very healthy. Needless to say, you don’t need to be well-endowed to get ahead of the game. You just need a bit of luck along the way.